A look at the issues raised by the Shamima Begum case. A look ahead to this year's Oscars - why are women missing from so many of the big categories ? Young people and alcohol. 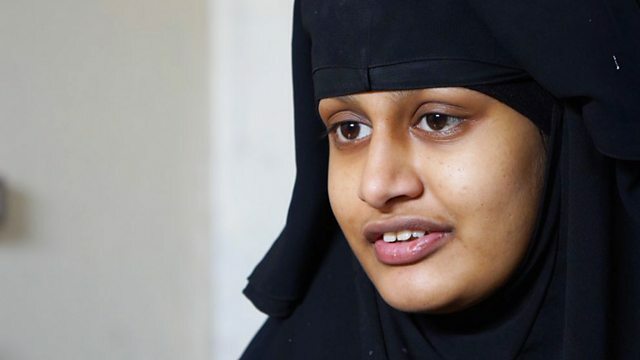 A look at the issues raised by the case of Shamima Begum the 19 year old former east London schoolgirl who travelled to Syria back in 2015 to join the Islamic State group. We hear from Huda Jawad a Muslim feminist, Nimra Tahir who's a lawyer and Saiqa Ali from WARN - Women Against Radicalisation Network. As we approach this year's Oscars which has seen the #OscarsSoMale trending Jane talks to Radio 4 film podcast presenter and playwright Melody Bridge No women have been nominated in the Best Director, Original Score, Film Editing and Best Picture categories this year with only a quarter non-acting Oscar nominations going to women. Yesterday she talked about some of the films that have missed out. Today she compares modern female film makers with some of their counterparts in the past. What do you do if you suspect your child is drinking alcohol and everything seems to be getting out of control? And what’s the best way to introduce alcohol to your child – if at all? Jane speaks to Mandy Saligari, a former addict and author of ‘Proactive Parenting’ and Dorothy Newbury-Birch, Professor of Alcohol and Public Health Research, School for Social Sciences, Humanities and Law at Teeside University. This is an edited version of the original broadcast.